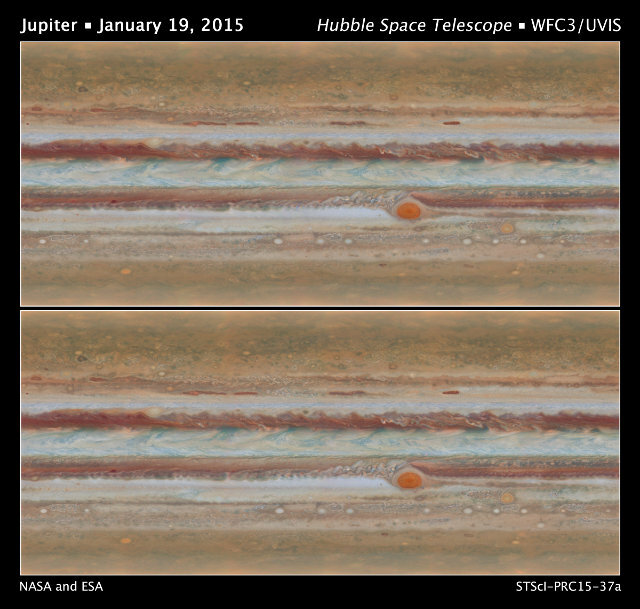 The Hubble Space Telescope was used to create new maps of the planet Jupiter. Hubble’s Wide Field Camera 3 captured a series of images of the planet within the Outer Planet Atmospheres Legacy program. The aim is to produce new maps every year and in the case of Jupiter 10 hours of daily shooting made it possible to discover new phenomena including changes in the Great Red Spot. The Outer Planet Atmospheres Legacy (OPAL) program aims to obtain observations of the outer planets for long periods to understand the dynamics within their atmospheres and their evolution as gas giants. This project will continue as long as the Hubble Space Telescope will remain in service. The best-known phenomenon of Jupiter, always interesting from a scientific standpoint, is the Great Red Spot, a storm larger than Earth. Discovered in 1665, it’s been the subject of continuous observations for over a century and those made in recent months with the Hubble Space Telescope confirm that it’s shrinking. The Great Red Spot’s shape is becoming more circular while in the past its shape was more oval. This shrinkage has been known for years and its long axis was shortened by about 240 kilometers (about 150 miles) compared to 2014. Recently, the pace at which it was shrinking increased but the latest changes show a pace closer to its long-term trend. Another change taking place in the Great Red Spot is in its color, less intense than in the past, therefore more orange than red. Am out of the ordinary filament is spanning almost its entire length and in the course of the ten hours of the observation sequence was seen continuously rotating and twisting. It was distorted by winds blowing at about 540 km/h (about 330 mph). Another phenomenon observed by the scientists is a wave that was observed, barely visible, only once by NASA’s Voyager 2 space probe. This time, that kind of wave has been observed in an area full of cyclones and anticyclones. In Earth’s atmosphere that type of waves, called baroclinic waves, can appear where cyclones are formed. It is possible that it originated under the clouds becoming visible only when spreads over them. Jupiter has been observed for a long time but these new maps created using the Hubble Space Telescope will help to better understand the phenomena taking place in its atmosphere. Improvements to existing models to explain these phenomena can also be applied to the atmospheres of other planets, more help in the study of exoplanets but also of atmospheric phenomena taking place on Earth.